Imagine walking up to a stream. On the far side lies our ideal learning environment -- student-centric, inquiry-based, resource-rich -- our Someday. A series of stepping stones indicates a way across. These are our Mondays; achievable objectives interspersed across a torrent of new technologies, practices, and theories. This Someday/Monday dichotomy captures one of the core challenges in teacher professional development around educational technology. As we look across to the opposite bank, we can see that the deep integration of new learning technologies into classrooms requires substantially rethinking pedagogy, curriculum, assessment, and teacher practice (Someday). However, as teachers, we need stepping stones (Mondays), and one of the easiest ways to gain experience with emerging tools is through individual projects or units. Teachers recognize the need to imagine a new future, to move towards the creation of innovative learning environments that provide our students with the best possible experience (Someday). In the meantime, we seek out a path of connected Mondays. In this four-part series, we are using the Someday/Monday concept to explore four dimensions of using tablets, such as iPads, in educational settings. We will do this by examining how teachers can take students on a journey from the consumption of media to curation, creation, and connection. In the first part of this series, we used the Someday/Monday template to explore Consumption. During the second, we examined Curation and the evolving role of the teacher as a curator of learning objects. This week, we will address Creation, examining what is possible when we empower students and teachers as innovators with iPads and other mobile devices. For centuries, a central role in education has been the creation of new content as a representation of understanding. Whether students used quill and ink, crayons and poster board, or keyboards and mice, this concept of creating dates back to the beginning of learning. Seymour Papert, the developer of the LOGO computing language, begins his landmark book Mindstorms with a story about gears he played with as a child. The tangible experience of working with gears accelerated his understanding of physics in a way that would have been much harder with only books and lectures. He refers to gears as “objects-to-think-with,” and his theory of constructionism holds, in its heart, the idea that humans find it easier to construct understanding if they use objects-to-think-with. Papert thought of computers, with their flexible, multifaceted capacities, as one of the premier objects to think with. Things made more sense to young people when they could manipulate and engage for themselves, either in directly digital ways or by controlling objects in the physical world. One simple way of understanding our pedagogical theory of iPads is that we don’t want them to just become replacements for notebooks and textbooks, we want them to be objects to think with. We want students using them to mess around with the world around them and their courses of study. In the best iPad classrooms, students are constantly making things. A big part of what they are doing is documenting their learning. At the EdTechTeacher iPad Summit in Atlanta, Jennie Magiera showed a video of a math student working through a problem on a screencasting app, talking aloud, showing and recording his work. I observed a biochemistry lab class at Deerfield Academy where students had iPads, and they used them throughout class to take pictures and video recordings of the lab experiments, which later became key parts of their reports and presentations. In helping students learn to make inferences from poetry, Kristin Ziemke has her first graders draw their mental images from poems that she reads. When I visited the Hillbrook School in northern California, I tried to visit a history class, but I was a few minutes too late. Just after the period started, students in period costumes dispersed across the campus, recording short reenactments. These rich examples of documentation evoke ideas from Project Zero’s Making Learning Visible and Visible Thinking programs. When students and teachers take the time to document their learning and create tangible performances, when they create objects-to-think-with, they deepen their understanding of material, and perhaps more importantly, create tools to spark metacognitive thinking about thinking. Tablets have shortcomings in creating certain kinds of learning objects (the iPad in particular is a very weak platform for learning coding and programming), but with the combination of camera, microphone, touchpad interface, and large viewing surface, tablets are terrific tools for creating a running record of student learning and activity. Open the camera app. Take a picture. Take a picture of your board at the beginning of class. Take a picture at the end of class. Take pictures of your students working. Take pictures of their notebooks. Take a picture of prices in the supermarket. Take a picture of something that makes you ask a question (visit Dan Meyer’s 101qs.com for inspiration). Take a picture of a local monument. Take a picture of the really tricky part in a science lab experiment. Tell your students to open the camera app. Have them take pictures. Have them take pictures of the board, their notes in progress, something that makes them ask a question. Have them take pictures of each step in their science experiment or each step in their design project. Take screenshots of their pathways through research and important documents. Take a picture of a flower. Use a photo annotation app, like Skitch, to label the parts. Print out the good ones. Cover the walls in pictures. Start from the bottom. Let the images accrue like sediment. Walk back through them regularly, like a geologist or archeologist parsing the layers of your documentation. Watch their accomplishments, stumbles, and insights accumulate over a year. 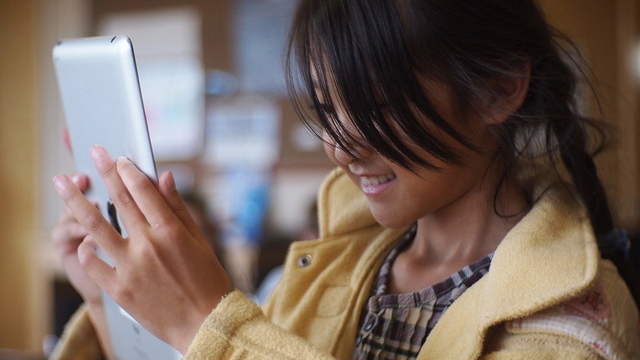 Have students get a screencasting app and start showing-and-telling their work. Have them talk aloud as they write a paragraph or solve a math problem. Have them describe an image from the historical record. Make them talk for a full minute, then two minutes, then three as they stretch their ability to notice particular details. Have them draw a scene, then describe the scene in French or Mandarin. As Kristen Wideen demonstrates with her grade 1/2 students, screencasting bridges the gap between the physical and the virtual in order to extend the learning context, encourage meta cognition, and provide students with a voice to explain their thinking. When they make a mistake on a problem, don’t give them the answer right away. Let them watch themselves interpret aloud their work. See if they can figure things out themselves. Projects, presentations, performances of understanding will come with time and exploration. Start by creating an image, and go forward from there.